1. (32064c) Axle hole Type 1 (+ opening), bottom ridges, reduced casing of the axle hole. Bottom ridges look like a stud holder with asymmetric 'teeth' (compare to part 61678) but do not allow connecting a stud in the middle position. Reduced casing has gaps in sides (refer to the second photo below). 2. (32064a) Axle hole Type 1 (+ opening), solid bottom pin, reduced casing. 3. (32064a) Axle hole Type 1 (+ opening), solid bottom pin, solid round casing. 4. (32064b) Axle hole Type 1 / Type 2, solid bottom pin, solid round casing. Rare variation whose axle hole has Type 1 opening on one side and Type 2 opening on the other side (refer to the third photo below). 5. (32064b) Axle hole Type 2 (X opening), solid bottom pin, solid round casing. 6. (32064b) Axle hole Type 2 (X opening), hollow bottom pin, solid round casing. Click on a colored part below to see the Sets and MOCs that use part 32064a Technic Brick 1 x 2 with Axle Hole Type 1 [+ Opening] and Bottom Pin in that color. You can find an overview of all LEGO Colors here. 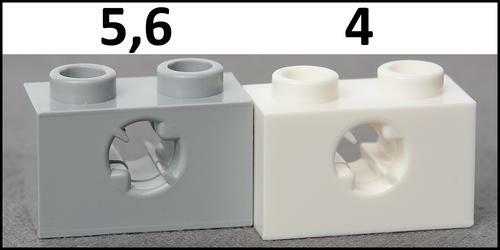 There are 4 Mold variations of part 32064a - Technic Brick 1 x 2 with Axle Hole Type 1 [+ Opening] and Bottom Pin in the database, in use between 1998 to 2019. 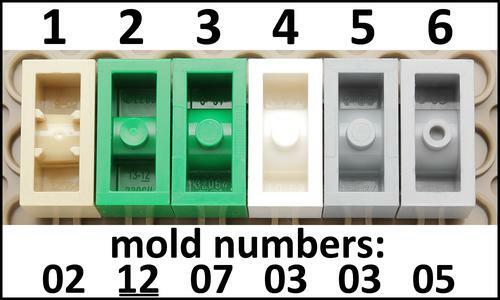 See Molds and other related Parts.